Teen activists from communities throughout Alaska held a press conference in downtown Anchorage on Tuesday, urging their state's government to take a stronger stance on climate change. 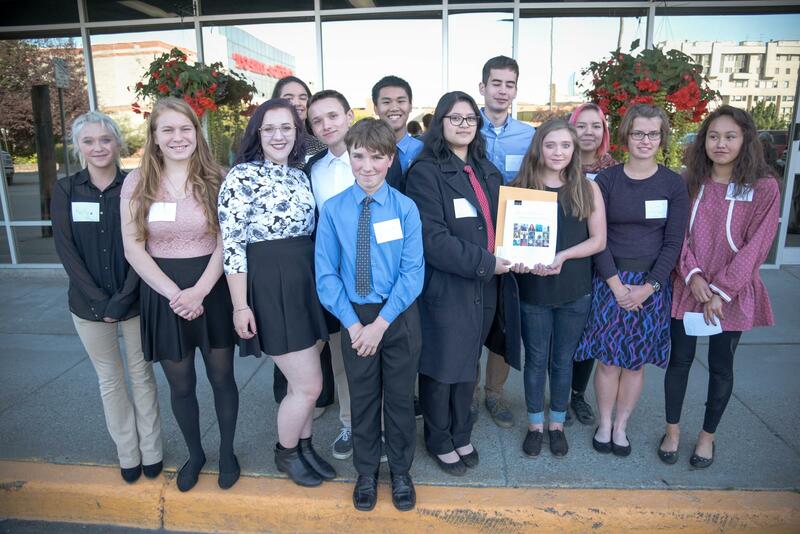 Yesterday, two students from Chevak joined teenagers from across the state in urging Alaska’s government to take a stronger stance on climate change. Leo Mendola, Mikelle Chayalkun and other activists held a press conference in downtown Anchorage Tuesday morning and submitted a petition for rulemaking to the Alaska Department of Environmental Conservation, urging the state to enact regulations on oil, gas, and other industries that could decrease carbon dioxide emissions. The event was organized by Alaska Youth for Environmental Action, or AYEA, an Alaska Center program that trains teen leaders to organize around environmental issues. "It would be nice to do something not only for not only Alaska, not only our village," said Mendola, age 16. "It’d be good to do something for the whole world." Mendola became a member of AYEA about a week ago, when a friend encouraged him to join. He said he plans to attend the program’s next summit if he can. Mendola can see the impact of climate change in his community, as permafrost melts and the shoreline along the river erodes. "This winter we didn’t get much snow, we actually had it raining in the winter," he said. "I believe that maybe in, like, 30 years we will also have to relocate our village." Mendola added that the nearby village of Hooper Bay might need to relocate a lot sooner than that. In addition to regulating CO2 emissions, the petition urges the Department of Conservation to adopt a Climate Action Plan, which would take a yearly inventory of greenhouse gas emissions in the state. Before submitting their petition, the teenagers spent three or four days in Birchwood Camp outside of Anchorage, attending peer-led teaching sessions on climate change and its impact.